Taipei, Taiwan – Oct. 11, 2018 – HyperX, the gaming division of Kingston Technology, today announced to join Game Start for the first time at Hall 401 – 403, Suntec Convention Centre in Singapore during October 13th and 14th. Fans will have a chance to try out newly-unveiled gaming accessories, including brand’s first in-ear head phone Cloud Earbuds, Alloy FPS RGB keyboard, and Cloud for PlayStation®4 (PS4™), the very first HyperXgaming headset got licensed by Sony Interactive Entertainment. In addition, fans will be able to participate in variety of activities, promotion and play with well-known Singapore E-sports team, B.O.O.T-dream[S]cape, at HyperX stand onsite. Cloud for PS4 is equipped with complementary PS4 matching blue color accents and award-winning HyperX comfort, making it a great fit for enthusiastic PS4 gamers. With its presents in Game Start, HyperX showed the ambition to engage massive console gamers that plays PS4 consoles across Singapore. HyperX also unveiled their first in-ear head phone Cloud Earbuds. Its 14mm Drivers bring rich sound quality with crystal clear low, mid and high tones and enhanced bass to elevate your gaming experience. With signature HyperX comfort, immersive in-game audio, and in-line mic with media controls, HyperX aims to bring a better class of comfort and performance to console and mobile gamers. The Alloy FPS RGB keyboard features Kailh Silver Speed mechanical key switches, featuring a light 40g actuation force and are rated for 70 million key presses, that offer shorter key travel time, less actuation force and durability for faster gameplay. The full-size RGB keyboard features a solid steel alloy frame in a compact design that frees up table space for the mouse and mousepad. On October 13th, the Tekken 7 qualifier competition of SEA Major 2018 Singapore will take place at HyperX booth PS4 zone from 11:00 a.m. to 7:00 p.m. Besides, gamers will also be able to enjoy PC and Switch zone for free game play during all day. On October 14th, well-known E-sports team B.O.O.T-dream[S]cape will come to HyperX booth and play CS:GO with fans. Apart from that, HyperX Tekken 7 Sudden Death Tournament will also be held at the booth and the winner can get a Cloud Stinger Core console gaming headset as the grand prize. 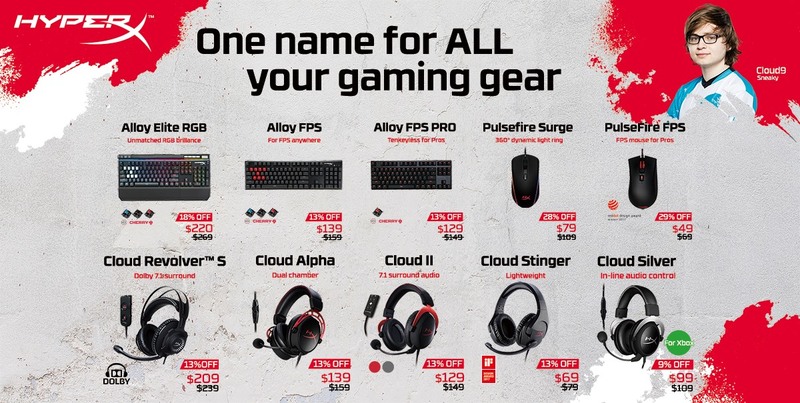 Moreover, during the whole Game Start event, HyperX will provide up to 40% off onsite discounts for selected HyperX gaming peripherals in limited quantity. So gamers don’t miss out the great deals, a full schedule of fun activities and lucky draws! Tekken 7 Sudden Death Tournament competition: Joining one of the 20-minute tournaments, attendee who competes sudden death round and wins at 20 minutes mark will get a Cloud Stinger Core Console Gaming Headset. October 14th: 4:15 p.m. – 5:45 p.m.